On Friday, Mr Trump tweeted “WE WILL NEVER FORGET” alongside a 43-second edited video showing footage of the 11 September 2001 terrorist attacks, spliced with a speech by Ms Omar. The tweet, which had been posted to the top of Mr Trump’s Twitter feed on Sunday, was removed after Democratic Speaker of the House Nancy Pelosi made the request to the White House, but is still viewable on his feed. “The President’s words weigh a tonne, and his hateful and inflammatory rhetoric creates real danger,” she said in a statement while travelling in London. “President Trump must take down his disrespectful and dangerous video,” she said, adding that security officials are reviewing Ms Omar’s protection and “will continue to monitor and address the threats she faces”. 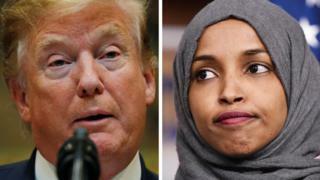 But on Monday, Mr Trump stepped up his attacks on both lawmakers, saying Mrs Pelosi “should look at the anti-Semitic, anti-Israel and ungrateful US HATE statements Omar has made. “She is out of control, except for her control of Nancy!” he said of Ms Omar.